← Diet Linked to Lower Risk of Alzheimer’s Disease. See the amazing statistics on sugar consumption in the U.S.
A new study recently published in today’s Journal of the American Medical Association has concluded that sugar intake significantly contributes to ill-health and specifically increases cholesterol levels. Researchers at Emory University and the Centers for Disease Control and Prevention in Atlanta examined the added sugar intake and blood fat levels in more than 6,100 adults. Added sugars included table sugar, brown sugar, high-fructose corn syrup, honey, molasses, brown rice syrup, agave syrup and other caloric sweeteners in prepared and processed foods — for instance, in soft drinks, iced tea, candy, pastries, cookies and canned fruits. Not included: the sugars in fruit, 100% juice and other whole foods. Participants consumed an average of 21.4 teaspoons of added sugars a day, or more than 320 calories a day from these sources. About 16% of participants’ total daily caloric intake was from added sugars. That compares with 11% in 1977-78. People with the higher intakes of added sugars were more likely to have lower levels of HDL (good) cholesterol and higher levels of triglycerides (blood fats). The added sugar of common foods is astonishing. These statistics are truly amazing. Most people are completely unaware of the amount of sugar in their diets. Remember, this is considered “added” sugar. This does not take into account the naturally occurring sugar in fruits, fruit juices and other whole foods as mentioned above. While fruits are good for you and I do recommend that people consume them, I never recommend that people consume fruit juices. That is a huge source of sugar for most people and unfortunately they consider sitting down and drinking a glass of orange juice as healthy. There are worse things you could do, but there are also better things you could do for your health (like not drink it). Consider that there is about as much sugar in a glass of OJ as there is in a soda. Fruit is different than fruit juice. Human beings we were designed to sit down and have one apple or one orange. We were never intended to sit down and eat 3 or 4 whole apples or oranges – the amount of fruit that it would take to get the sugar content of one glass of fruit juice. Senior author Miriam Vos, an assistant professor at Emory say, “People have been so focused on fat that we haven’t been focused on sugar, and it’s gotten away from us. This data show we can’t let either one or the other get too high.” I don’t agree. The statement would read correctly if it said that traditional medicine has been so focused on fat that they forgot to look at sugar. Many functionally trained physicians including chiropractors, naturopaths and certified clinical nutritionists have been saying sugar is a huge culprit for years. I see it routinely in my practice. People come to me with high cholesterol, weight issues, diabetes, high blood pressure and other health issues and the first thing I do is cut out the sugar and carbohydrates. They continue to eat healthy fats and proteins. They lose weight, improve cholesterol profiles, reduce their blood pressure and their diabetes disappears. It is simple physiology. It would make sense that fat makes you fat, but like most things in medicine the obvious is often times not the answer. This holds true in this instance as well. People need to take responsibility and be aware of just how much carbohydrate they are putting into their bodies. After all, carbohydrates, not just simple sugars are contributing to this problem. 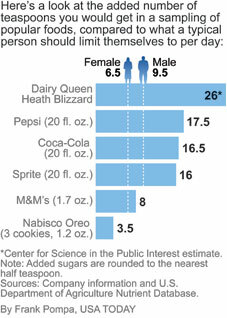 The American Heart Association is recommending that women get no more than 6.5 teaspoons of added sugar per day and men get no more than 9.5 teaspoons per day. While I still view this is high (because people often have other sources of naturally occurring sugar in their diet) it’s a good start. Remember, the average participant in the study consumed a whopping 21.4 teaspoons of added sugars a day! That is astronomical. Imagine sitting down at breakfast, lunch and dinner and shoveling in 7 teaspoons of sugar at each meal. You probably wouldn’t do that because you’d view it as terribly unhealthy yet the average person does it every day without even knowing it! Sugar consumption in this country is out of control and as a person that works in the health field I have been well aware of it. Unfortunately, I think traditional medicine will continue to teach the low fat mantra that has led so many to be so sick in this country. The numbers are finally there. I can only hope people will take this health threat seriously and something will be done about the amount of added sugar that is in our diets. This report is spot on. I had metabolic syndrome with sky high triglycerides and pre-hypertension. My doctor recommended a no HFCS, minimal sugar, whole grain diet. I lost 15 pounds over the holidays in 6 weeks. Seven months later, normal triglycerides, normal blood pressure, and my BMI has gone from 29 to 25. Weight control is now easy. My gut is gone. I feel great. Good For You! If Only More people listen to your call, we would be a healthier nation. I have been Calling on everyone to cut back on Sugar of any kind or source, because it is flat out bad for you. The same with Salt. Do you have the link to the published study? This article was great! Just the information I was looking to learn more about. Great information! The site above is the US governmental site that compiles ALL studies ever published. You can’t always read the entire study, but a summary is always provided. I am sure if you search, you can easily find other studies supporting this one. Enjoy! Awesome! Thank you!! We included it in a little post we did: http://thelittleaussiebakery.wordpress.com/2012/05/31/sugar-the-habit-healing-it/. Keep up the good work!